Are you a member of the Brotherhood of Black Sock Wearers? The Rules seem to have mixed feelings on black Socks for cycling. However, I think they have been overly influenced by a certain cyclist from the State of Texas. My use of black socks for cycling goes back a number of years, and way before, Big Tex started doing it. It was based more on utility and pragmatism than anything else. Back in the early 90's I was living in Vancouver, B.C. For those who know Vancouver, know that it rains a bit in Canada's Lotus Land, and you are often out riding in what locals call "Liquid Sunshine", more than you would like. There were some regular group road rides that I would attend, and I noticed that the hardest of the hard-core guys, like mountain bike ace, Bruce Spicer would wear black socks. I would always return from these gritty, wet, winter rides with my nice white cycling socks, now several shades of grey - a grey that would not wash out, no matter how many times through the washing machine, I note. So I went black! Problem solved. I can't take full credit for it, but when Sugoi started to make cycling socks, when I was working there in the late 90's, I pushed in a planning meeting, to "Make sure you offer those socks in black". Made sense, Sugoi was a Vancouver based cycling apparel company - we knew about riding in dirty and wet conditions. Since then, the sock business has exploded - it's a new sub specialty product category all itself these days. If you walk into a cycling or running shop you'll be faced by a wall of socks, from a variety of manufacturers, and a rainbow of colour options and designs, beyond the basic white sports sock. There are even anatomically correct options for your left and right foot . . who knew? However, my eyes are always drawn to the black socks. My current preferred socks are the DeFeet Aireator Black High-Tops (pictured above). Simple. Basic. Black. Never get dirty. Always look the same! However, as you can see, on a quick perusal of the DeFeet website, their socks come in many different colours with all kinds of funky and cool designs. With socks these days, you can go crazy! Check out these retina wreckers from my friend Joe Foster from Sock Guy. Now, when you see another cyclist wearing black socks, I am not sure what it is but, it's usually a veteran, someone who's been around for a few years. The kind of fellow rider that you just have to give a nod, to, to know that he/she get's it! They've been around the block a few times. They are comfortable in their own skin, and on the bike. You can be comfortable sitting on their wheel, or next to them in the group. They'll be calm and cool! And perhaps most importantly, they don't have to worry about keeping their white cycling socks, white! 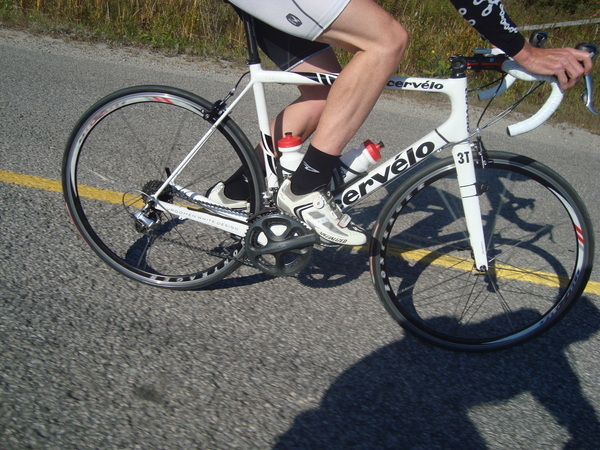 I used to go with the black socks a lot of the time but during a few heat waves, I had to go back to white for races. In a few duathlons, my feet were on fire in the black socks and it became a distraction. Now I go white on the very warm days and black on the cooler days. The only pairs of socks I have that are block are compression. Otherwise white and no show! In only have one pair of black cycling socks. It was pair I got for free from a UK cycling magazine. As it turns out, they're the best feeling and (to me) best looking socks I have for cycling.....go figure. Anyway, black is cool! I've also been wearing black socks since the '90s! It just made sense for mountain biking and I've continued for running. I hate dirty white socks! I always wore black and other dark color wool socks when I lived in Seattle. They worked perfectly in those rainy conditions. Now that I live in Arizona, it's all white, all the time. I think it is very hard to get away wearing black socks for sport although I think Mike Tyson got away with it. You come to AM because you want to better yourself, and bettering oneself always involves setting and confronting challenges. That's why you request new responsibilities at work, approach the hot women in bars and increase your reps in the gym. Find the huge collection of thick cycling socks in USA. These socks are made from lightweight and breathable fabrics that keep your feet cool and dry in hot weather.